Many people might assume that the Puget Sound region is too rainy to be good for growing grapes, but it actually gets a similar amount of rain as the famous French winemaking region of Burgundy! 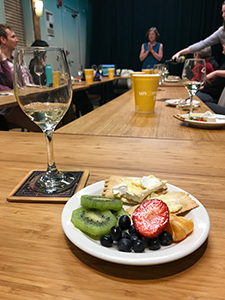 That was just part of what an enthusiastic group of Co-op members learned at our recent Evening with Bainbridge Vineyards. Winemaker Betsey Wittick and Sales Coordinator Sara Bean treated attendees to stories of the vineyard and the winemaking process, and, of course, samples of their fantastic wines! Betsey came to Bainbridge Island thirty years ago from New Jersey after studying plant science at Rutgers and getting a master’s degree in horticulture at Cornell. She began working for vineyard founders Gerard and JoAnn Bentryn, who had identified the Puget Sound as a bioregion with similar growing conditions to the northern European wine regions that Gerard had experienced while doing his military service in Germany. The Bentryns had bought the farm from Akio Suyematsu, whose family had worked the land since 1928 (except for the time in which they were victims of Japanese-American internment during World War II). 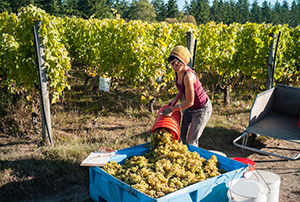 When the Bentryns retired in 2013, Betsey purchased the vineyard with a group of Bainbridge islanders who believed in local foods and valued the vineyard as important to the community. 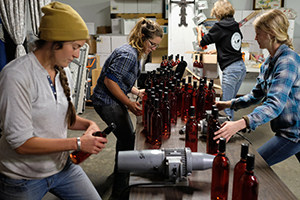 Reflecting the values of her community, she recently decided to make the vineyard a B Corporation. B Corporations are legally required to consider the impact of their decisions on their workers, customers, suppliers, community and the environment, and undergo a rigorous certification process. Betsey led participants through the many decisions that go into the grape growing and winemaking process. Because Gerard Bentryn was sensitive to engine fumes, Betsey taught herself how to use draft horses for many tasks, a skill she has passed on to younger farmers over the years. While many vineyards use Roundup on their vines, Betsey uses other pest-reduction methods which lead to a more biodiverse farm. She avoids techniques that some bigger wineries use, like adding food coloring to make wines darker or brandy to increase the alcohol content, and believes ingredient labeling for wine will soon become standard because of these practices. Throughout the evening, Sara poured a variety of Bainbridge wines for participants to sample, from vineyard staff favorite Pinot Gris, to the popular, floral Madeleine Angevine, to the spicy, sweet Siegerrebe, which Bainbridge is the first US vineyard to produce. Things wound up with their amazing raspberry dessert wine, which pairs great with chocolate! This event was part of a series of “Evening with…” events, where Co-op members get to interact with some of our valued Washington producers. The next event will be An Evening with Mikuni Wild Harvest on May 14. Space is limited, so RSVP early!